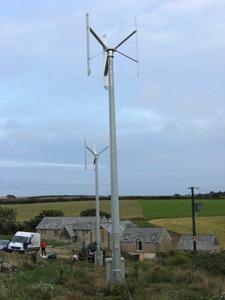 Vertical Wind Energy Ltd has developed a 6kW wind turbine unit, designed so that the blades are vertical and spinning around a vertically-aligned generator. 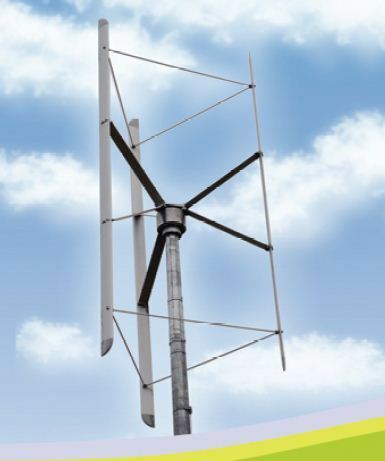 Our new 6kW vertical axis wind turbine is currently undergoing evaluation. This is designed to predominantly meet the needs of large dwellings, company premises and farms. In manufacture, we aim to use many of the components of the 3kW machine with essentially longer blades. Mast and foundations structures will be larger, though we continue to use the 12m masts as standard. We are currently finalising the prices of the unit following our beta test trials and the 6kW version will be available in the first quarter of 2010. The turbine cuts in around 6m/s (around 10mph), and reaches maximum capacity at 12.5m/s (20mph). Each blade is over 6m (20ft) long and they rotate on a 3.27m (10.5ft) diameter circle. No noise data has been provided, which is a great shame given that this is a new technology and needs to be compared to other wind systems. Data taken from the company's Field3 Mk.1 PDF document. Hi, wondering if anyone has a VWE Ltd turbine installed. They are no longer trading and ours needs repaired. I have found a company who will try to help. Just wondered if anyone else in same predicament and what they are doing about servicing even if operational? Hi SMJ, would the reply from David Stanton be of any use to you now? I know this was an old post, but just came across it. My company manufactured components for the rotating turbine section, and we in theory could make spares. We also have a few bits on the shelf. I also have one of these in my garden! If you let me know if you still have problems I will see if there is anything we can help with. Thx Dave, reluctantly decided to scrap it since VWE didn't resurrect itself, and reluctance of other companies to service it even if we got it repaired. If anyone is looking for spare parts, may be able to assist. I strongly recommend that anyone with a turbine takes out insurance irrespective of installers warranty period.